Welcome to the OFFICIAL Dupree Lakes HOA website. Dupree Lakes is a Planned Community located in Pasco County, Florida, that prides itself on great neighbors, well kept yards, being family friendly and offering the feeling you are out in the country, even though stores, restaurants, libraries, youth recreation fields and other amenities are less than a 10-minute drive away. Surrounded by conservation and water areas, the abundant wildlife is our constant entertainment. Osprey, hawks, owls, woodstorks, sandhill cranes and a multitude of other birds share their space with us, deer, bunnies, turtles, and the typical Florida animals found in hammocks and along wetland areas. You can even watch fireflies blink on-an-off on a warm summers eve. Community members have access to a beautiful clubhouse and area with resort style pool, lighted tennis courts, basketball courts, a soccer field and children’s play area. Sidewalks for strollers and runners are located on both sides of every street and on each side of Dupree Lakes Blvd. The main accesses to Collier Parkway on the South Eastern end and Ehren Cutoff to the North Western end, provide quick access to main county and state roads as well as toll roads and Interstates. It is comprised of 664 homes, divided into 9 neighborhoods with streets named after many of the flowers which were abundantly displayed in the original and historically significant DUPREE GARDENS, most of which is now the Dupree Lakes Community. Dupree Gardens was 25 acres of interlacing trails of horticultural awe! Designed and created under the direction of J. W. Dupree, (a Tampa attorney with a penchant for gardening), within his 900-acre estate, it was called- "The Blossom Center of Florida". And for a brief time in the 1940s, visitors thronged to see the gardens from throughout the nation during the annual November 15 to May 1 season as one of the first roadside attractions in the state, that has become synonymous with tourist attractions. 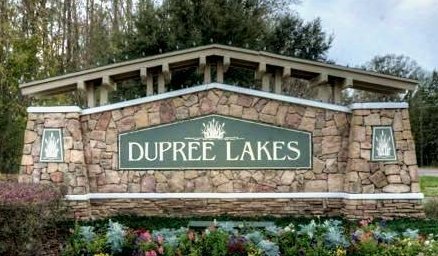 Dupree Lakes is locally governed and operated by two separate, but equally important, organizations; a CDD and an HOA, and their respective boards. So what is the difference between a CDD and an HOA? The Dupree Lakes CDD is a form of county government whose purpose is to provide for ownership, operations and maintenance of various capital facilities (Common Grounds) such as the clubhouse, pool, retention ponds, wetlands and woodland areas and other general use amenities within the community. Through an agreement with Pasco County, the CDD is also responsible for improving and maintaining the landscaping along the right-of-way and in the median of Dupree Lakes Blvd. CDDs are governed under Florida State Statue, FS 190. For more information via the Dupree Lakes CDD website, click here. The Dupree Lakes HOA is a non-profit, state incorporated entity whose purpose is to provide oversight of development and maintenance of member’s homes & lots within the District, for the betterment of the community in total, including and primarily - the value of individual properties. HOAs are governed under Florida State Statue, FS 720. While the general use amenities are under the oversight of the CDD, your HOA Board, management company and various committees work diligently to help members keep up property values and maintain a beautiful, harmonious and safe community. Florida, Pasco County, Dupree Lakes. Wonderful and beautiful places to live and grow families and make friends.